K1 Technologies is now helping resolve one of the more frustrating idiosyncrasies of the LS engine platform; that is, GM’s switch from 24 to 58 teeth on the reluctor wheel. Now that millions of LS engines and parts are in the salvage yard, available at swap meets or posted in online classifieds, the difference in the reluctor wheel can limit creative vehicle builds or engine swaps. One such option is adapting LS7 dry-sump gear to a Gen III block. The reluctor wheel is pressed onto the back of the crank on the register just in front of the rear journal. This crank does not have a reluctor wheel yet and hence can be adapted to work in either a Gen III or Gen IV LS engine. What’s a reluctor wheel got to do with the oil system? The LS7 crank has a snout longer than a standard LS engine. This extra length is needed for the differences in the LS7 dry-sump oil pump, balancer, timing set and front cover. However, the factory LS7 crank has a 58-tooth reluctor wheel while the Gen III vehicles are equipped with an ECU that recognizes signals from a 24-tooth wheel. The only way to make such a swap is to replace the 58-tooth reluctor wheel with a 24-tooth version. But you can’t just hammer them on and off. The wheels have to be indexed precisely. 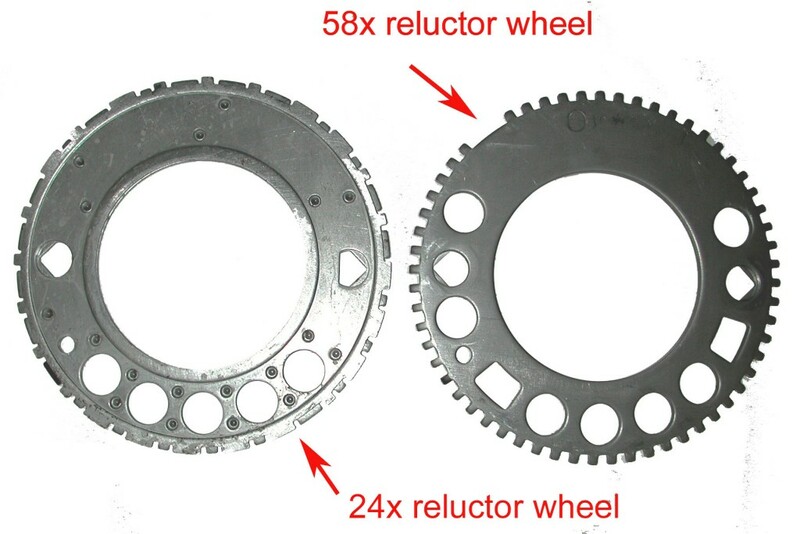 The reluctor wheel has an important job telling the ECU where the engine is in its rotation. This allows for the perfect sequencing of vital functions such as sequential fuel injection and ignition timing. Gen IV engines utilize a reluctor wheel with more teeth, which provides a higher resolution signal to the computer. So why convert to dry sump? The LS7 dry-sump system is designed to provide a constant oil supply, regardless of G-forces encountered while driving through a high-speed turn. With a typical wet-sump system, those G-forces can drive oil in the engine-mounted oil pan away from the pickup, starving the oil pump for a few precious seconds. A dry-sump system has a tall external oil tank with additional capacity that maintains a constant supply of oil to the pump, regardless of the G-forces on the vehicle. Also, the dry-sump pan is very shallow compared to the wet-sump pan. The dry-sump pan will provide additional clearance when making suspension modifications or repositioning the engine to achieve a lower center of gravity. 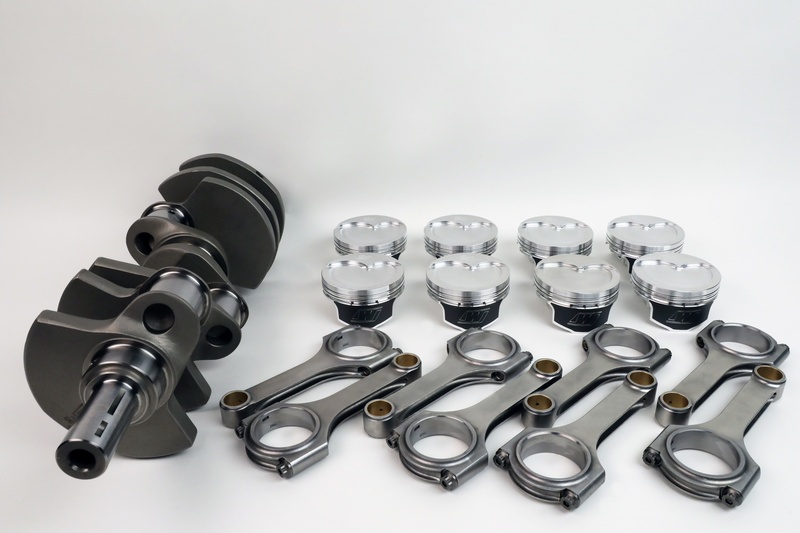 K1 Technologies and Wiseco Pistons have teamed up to offer several complete rotating kits that accomodate the necessary bore, stroke, and reluctor wheel tooth count for popular LS engine applications. Another possibility is stroking an LS3 and adapting a dry-sump system. The LS3 comes with a 4.065-inch bore and 3.622-inch stroke crankshaft. Adding a 4-inch crankshaft increases the displacement to 415 ci, or 6.8-liter. 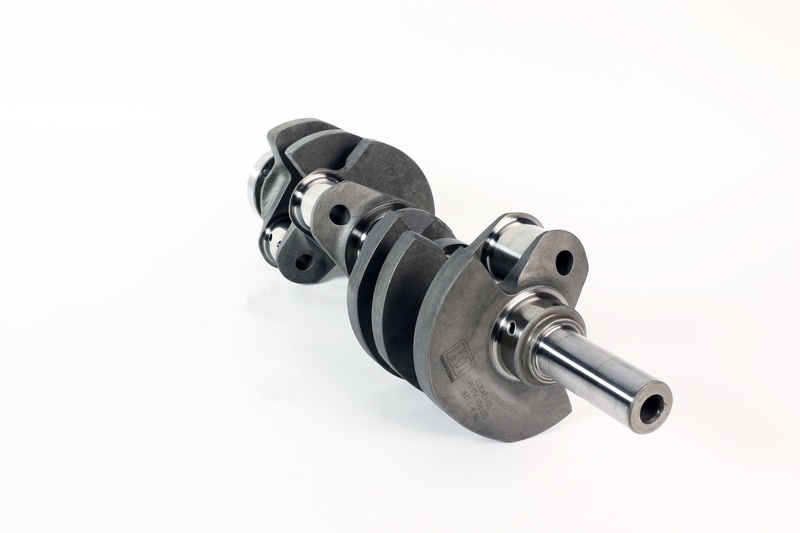 The K1 crankshaft comes with the LS7 4.000-inch stroke. 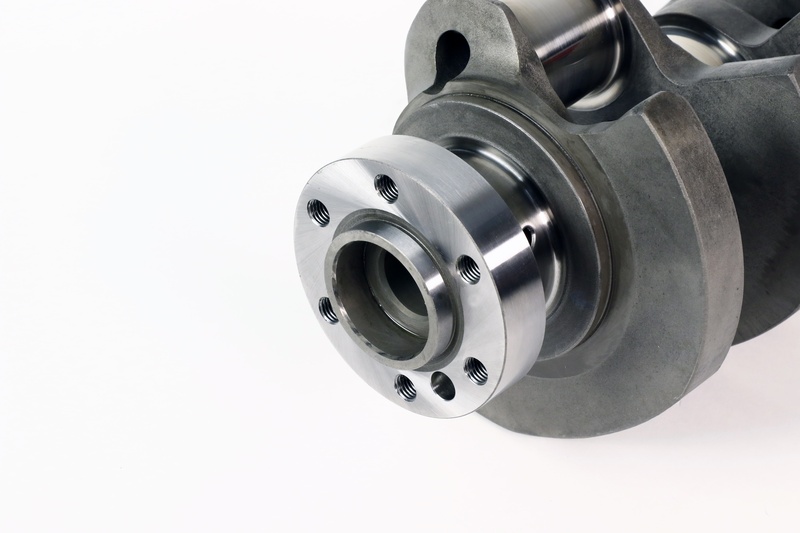 It’s constructed from a 4340 forging that is engineered for high-stress and racing applications. The bearing surfaces are nitrided for improved strength and bearing life. Other features include large fillet radii for additional strength and a straight-hole oiling system to improve bearing lubrication. The crankshaft comes with the standard 2.650-inch main bearing diameter and 2.100-inch rod bearing journal diameter. It’s also designed for 6.098-inch connecting rods and weighs around 53 pounds. “It's a 4-inch stroke by 24 tooth. It's a combination that never came factory but you essentially could find yourself with a factory crank and do it that way. This is stronger, and it's reliable,” adds DiBlasi. The longer snout of the LS7 style crankshafts allows factory dry sump components to bolt directly into older (gen III) LS engine platforms. Mounted at the rear of the crankshaft, the reluctor wheel—sometimes called a tone wheel—is part of the engine management computer system. A magnet sensor mounted at the rear of the cylinder block reads the teeth on the reluctor wheel to determine the exact crankshaft position as it rotates. This information is relayed to the computer so that the proper spark and fuel delivery can be executed. It’s easy to tell from the outside if an engine has a 58- or 24-tooth reluctor wheel. The sensor mounted on the back of the cylinder block is a different color for each wheel: black or 24x and gray for 58x. The reluctor wheels are interference fit to the crankshaft, but it takes a specialist to remove and replace one. The wheel has to be heated and expanded for removal. The more difficult step in installing a wheel is to ensure that it is indexed properly. You can’t eyeball this step. There is a dedicated tool available that positions the new reluctor wheel exactly where it’s required. Heat is also applied to the new wheel as it’s pressed into position on the crankshaft. The new 4-inch crank with a 24-tooth reluctor wheel could be used in a Gen III 4-inch-bore block, such as the LQ4 or LQ9 truck engines. This combination would provide a square bore/stroke ratio and result in 402 ci or 6.6 liter. It could also be used in the LS1 or LS6 with a 3.898-inch bore, resulting in 382 ci or 6.3-liter.